A whole, cut-up chicken, browned in cooking oil, slow stewed and finished with fluffy, rolled dumplings. Whole chickens go on sale around here all the time, usually at 99 cents a pound, though sometimes as low as 69 cents. They usually restrict the number you can get, but I always get the limit and go back for a few more another day if there's room in the freezer. It's considered a loss-leader in the industry, and it works, because that second trip always ends up with additional grocery purchases, even if only to stock up the pantry with canned goods and such. Although a 3 to 4 pound chicken is sufficient, I say get a bigger one and put up what you don't use here - that's what I do! The chicken I used here was nearly 6 pounds, so I had a few cups to freeze for another meal. 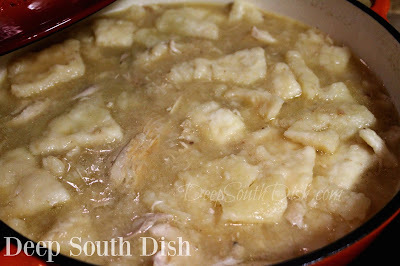 I have to admit, I do play around with my chicken and dumplings often, so I'm not exactly married to any one method. From drop dumplings to rolled, to slow stewed to a shortcut method using a deli roasted chicken from the grocery market and canned biscuits, for me they are all delicious and satisfying! For this, I am browning the chicken pieces before stewing them, though the purpose of browning the chicken is not to keep color on the chicken, but more for the fond, those little browned bits that develop on the bottom of the pot and add a lot of flavor. I let the chicken stew for at least an hour and a half on very low, but often let it go even longer, until I'm ready to do the dumplings. To reduce fat, you may remove the skin before browning. For a richer flavor, I also used chicken stock combined with water, instead of all water. Unsalted is what I had on hand, so I'm calling for adding 1-1/2 teaspoons of salt to the stew. Keep that in mind if you use salted chicken broth, as you may not need much or any additional salt. Just be sure to taste and adjust for salt. Also, if you skip the stewing of the chicken and use a deli rotisserie chicken, those are plenty salty, so keep that in mind with any additional salt as well. Because I love fluffy drop dumplings - and apparently I am not alone - but I wanted to roll the dumplings, I was looking for something along the lines of a cross between drop and rolled dumplings. These worked out great using self-rising flour, butter and whole milk. 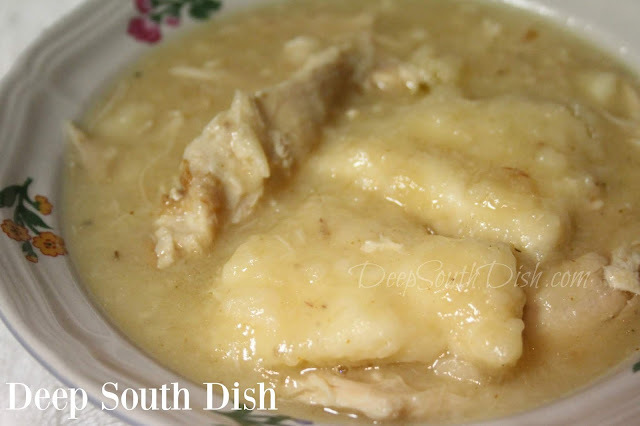 I got everything I was looking for in this version of chicken and dumplings. Here's how to make it, and as always, the full recipe with amounts and instructions, along with a printable are further down the page. Just scroll on past the step by step pictures. You do not need to request access in order to print and/or save a file to your Google drive. Access is only for editing! By the way, of course you can shortcut this and use a roasted chicken from your favorite grocery store deli (factor in the salt though), but really, you can't beat the flavor from a stewed chicken. Either way is good, but we're starting with a whole chicken here, so just cut that up into leg quarters and breast halves. You don't have to get fancy - just break it down some! Heat oil in a Dutch oven or large pot over medium high heat. Lightly brown chicken in hot oil in batches, about 5 minutes on each side. Remove and set aside. Add onion to drippings and cook until softened; add garlic and cook another minute. Add a splash of the broth to deglaze the browned bits from the bottom of the pot. I prefer using Kitchen Basics stocks. It's my favorite brand and a pantry staple for me. Return chicken to pot, pour in chicken stock/broth and top off with enough water just to cover, add salt, bring to a boil, reduce to a low simmer and let cook until chicken is cooked through and tender, about 90 minutes. Remove chicken and set aside to cool before pulling meat from the bones. For the dumplings, cut cold butter into flour until it is crumbly. Add milk to form a soft dough and turn out onto a lightly floured counter. Roll to 1/4 inch thick, cut into squares and sprinkle top lightly with additional flour; cover with a clean kitchen towel and let rest until needed. Check broth for any stray bones and bring to a rolling boil. Drop in dumplings, one at a time until all are in the pot, reduce heat to a low simmer, cover and let cook without lifting lid for 40 minutes. Remove lid, gently push dumplings aside and stir in chicken, taste broth and correct salt, pepper and Cajun seasoning, as needed. Yummy! Makes about 6 to 8 servings. For more of my southern favorites, check out the collection on my Pinterest page! Heat fat in a Dutch oven or large pot over medium high heat. Lightly brown chicken in hot oil in batches, about 5 minutes on each side. Remove and set aside. Add onion to drippings and cook until softened; add garlic and cook another minute. Add a splash of the broth to deglaze the browned bits from the bottom of the pot. Return chicken to pot, pour in chicken broth and top off with enough water just to cover, add salt, bring to a boil, reduce to a low simmer and let cook until chicken is cooked through and tender, about 90 minutes, depending on size. Remove chicken and set aside to cool before pulling meat from bones. For the dumplings, cut cold butter into flour until it is crumbly. Add milk to form a soft dough and turn out onto a lightly floured counter. Roll to 1/4 inch thick, cut into squares and sprinkle top lightly with additional flour; cover with a clean kitchen towel and let rest until needed. Check broth for any stray bones and bring to a rolling boil. Drop in dumplings, one at a time until all are in the pot, reduce heat to a low simmer, cover and let cook without lifting lid for 40 minutes. Remove lid, gently push dumplings aside and stir in chicken, heat until warmed through, taste add salt, pepper and Cajun seasoning, as needed and serve. Cook's Notes: The flour on the dumplings helps to thicken the broth since there's no roux. If you'd like to thicken it further, stir in some Wondra quick mixing flour before adding the chicken. You should have about 3 to 4 cups cooked chicken. I like to buy a larger chicken since it cooks in about the same time and put up the rest in the freezer. The stew portion can be made in advance and refrigerated. Solidified fat may be scraped off the top to reduce fat calories if you prefer. I'm going to run to the store and grab a chicken. With all the rain we're having, this will be a good recipe to make today. Thank you!!! It'd be a good day for some C&D here too - rain, rain, rain. Enjoy Karin! I love loss leaders! One of my fav stores does .39/lb whole chickens (with the giblet packs). They are packed 2 to a bag with a four bag limit. I met a lady at the meat case who said, "but who needs 2 chickens?". I told her how to do a spatchcock--how easy and fast. She said she was expecting company and would give 2 chickens a go. I will be visiting my son soon and planning to teach him to spatchcock--and I will also make this recipe with him and give his wife a break. The only thing better than simple and delicious is simple and delicious with a sale. Thank you. That's one of my favorite ways to roast & grill them. Much faster! I haven't seen 39 cents a pound chickens around here in forever, lucky you!